I don't know if any of my gentle readers recall the early Southpark episode where Tweak is out of his mind due to his constant coffee drinking and thinks he sees little gnomes stealing his underpants. It turns out he was right all along, and that there was a gnome civilization living in the sewers (next to Mr. Hankey the Christmas poo I presume). The other day I was reading some more Radical Orthodoxy. Milbank was faulting Scotus for arguing for the Immaculate Conception because it meant he could not appreciate fully the christmas carol "o felix culpa." He also said (apparently reviving the 19th century fantasies of Kleutgen or Stockl) that Scotus's views on the Incarnation amounted to having a series of predicates with nothing but the world to inhere in (though he did not make Kleutgen's follow up inference that this meant Scotus was a pantheist). Best of all, while allowing that the term "transubstantiation" predates the council of Trent, he claimed that the term "real presencef" dated to 1550. Moving on, Pickstock was so incensed by the Formal distinction that the only way she could detail the absolute horror and unease it introduced into metaphysics was to chronicle changes in bathing practice from the classical, medieval, and victorian eras (In true RO style I shall give only vague references to these opinions. Cf. Milbank, Being Reconciled, p. 3-300, Pickstock ). Reflecting upon these matters, I was struck by the similarity to the Underpants gnomes. When the children ask the gnomes why they steal people's underpants, they respond in their cute high-pitched voices, "stage 1: steal underpants. Stage 2: ? Stage 3: Profit!!" Radical Orthodoxy's method works very much the same way. Stage 1: Scotus says something that Aquinas does not. Stage 2: ? stage 3: Modernity! Holocaust of Nihilism! For the "?" one must imagine the little gnome shrugging his shoulders and making a questioning, wordless, utterance. 1. Every post (few as they shall be, don't worry) that shall treat of Radical Orthodoxy shall be labelled as "Humor", due to the unscholarly, unhistorical, obscurantist (even, dare I say, gnomic) character of their work. 2. Therefore, I shall open the polls for a new name, more accurately characterizing the movement (recall Scott Carson's recent post on RO's relation to traditional sexual ethics when you vote, or the fact that Pickstock plagiarized her own 2003 article and republished it with minor modifications in 2005..."in doing so" became "in so doing" and "abiding nature" became "binding nature", just some of the 30 pages of gems). Personally, I tend towards 4 or 5. I am a little uncomfortable with 4, however, as it almost gives them a respectible sheen from the Oxford fantasist, ie., JRR Tolkien. I'll admit, they have certain similarities. Both engaged in subcreation of a world that never existed, but wished it did. Both invented their own languages for their characters to speak, and so on. But only one would admit, in the end, that it was fiction so think I'll finally go with 5. A final note: In my quest to understand the true nature of the movement, I asked a collegue "Why 'Radical'"? She responded, "Because they're not Presbyterian!" Don't use quotation marks since those can't be employed in conversation. Awesome post. Personally I would propose "Cambridge Phantasists", hoping that the effeminate spelling and archaic-in-a-bad-way connotations would distinguish them from any inklings as much as dwarves are distinguished from dwarfs. I'm pretty sure, though, that "felix culpa" refers to the Exultet, not a Christmas carol. Unless there's one I'm not thinking of? Taylor, perhaps one could substitute a verbal emphasis or use one's fingers? But you're right, they look better on paper. well, Milkbank had this funky middle-englishy way of spelling it...plus, he called it a carol himself. That sort of turns it around, doesn't it? The degree to which this post is awesome cannot really be expressed by me. Whenever South Park is brought into conversation with Radical Orthodoxy I'm in heaven. are you guys serious? I guess everyone is entitled to their opinion; but to blatantly dismiss a theological movement as wideranging and strong as Radical Orthodoxy just seems a bit ignorant. Do you really consider the movement (and milbank in particular) to be "unscholarly, unhistorical, obscurantist"? That seems like such an odd claim to me considering the work of Milbank, Pickstock, Cunningham, Ward, et al. covers such a wide range of academic fields. People like Milbank and Cunningham particularly are taken quite seriously in fields outside theology and are invited to speak at conferences/departments that no other Christian theologians are invited to speak at. I think this says something about their level of scholorship. I must ask; if these guys aren't theological 'scholars'; who is? Please share with me the names and works of the brilliant theologians whom you are reading; because I'd love to see what you prefer to the RO crowd. I apologize if I sound a bit harsh; but it's a bit personal to me consider I moved from the states to Nottingham to study under these people who according to the "brilliant" minds on this blog are iddiots. The RO theologians are not scholars. They are rhetoricians perhaps, but don't have a scholarly bone in their bodies. Scholars are concerned with things like correct citations, correctly understanding the position one disagees with before making ridiculous claims about it, etc. Precisely in virtue of the fact that RO covers such ground makes them suspect. At first glance they see learned and intimidating because they run from plato, to the medievals, to the moderns. They give the appearance of having mastered all western thought. But when one examines the smallest hinge of their narrative it falls to pieces. 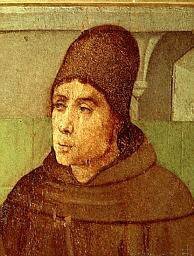 Duns SCotus, Thomas Aquinas, both are completely misunderstood and misinterpreted by RO, in the case of the former, I can only suppose wilfully and in bad faith because the historical duns scotus is so different from what they present him to be. This is also the conssensus of the scholarly community. one can find damming criticism coming from analytic philosophers, medievalists, neo-Platonists, all which show their misunderstanding and ultimatly, lack of interest in what the texts themselves have to say. I won't speak for my co-poster, but as for myself, I am academically trained in the historical-critical study of the blessed John Duns Scotus. I have read thousands of pages of scotus and quite simply, RO is just dead wrong. it's too bad this post strikes at certain life choices of yours, but from a catholic and scotist perspective, Radical orthdoxy is neither. To be sure, one can be sympathetic with their aims in the political realm, but leave the middle ages out of it. you ask what brilliant theologians I read: Duns Scotus, St. Bonaventure, ST. Thomas, need I really go on? I am a logocentric onto-theological medievalist. they have painted my intellectual patron in the blackest of terms, terms that bear no relation to anything the historical scotus ever wrote. So basically you're a medievalists? How sad. My big problem with RO is that they tend towards nostalgia, but that is much better than outright nostalgia. I like reading more than a few people and quite a few I disagree with. Most Scotus scholars (and it should be noted that scholarship is hardly to be lauded in and of itself) don't seem to agree with such a position. I'm not a medievalist. My degree is in philosophy, and I've studied all periods. It's true that I like reading medieval philosophy more than most, but I'm very fond of many ancient and modern authors as well. Faber is a medievalist in the sense that his degree is in medieval studies, but this should not be taken to imply that he only reads or esteems medieval books. His point was merey that, when not being misrepresented, the actual St Thomas, St Bonaventure, or Bl Scotus were better theologians and philosophers than the RO folks. Our problem with the RO people is not that they are nostalgic (thier nostalgia is for something that never existed, just as their enmity is for something that never existed), nor that we disagree with them, but that their works are largely fiction presented in the guise of scholarship and historical synthesis. I don't know what you mean when you say that scholarship is hardly to be lauded in and of itself. Certainly I agree that "mere" scholarship is no substitute for actual thinking, or for reading with a view to Truth rather than with a view to Fact. However, scholarship does have its (very valuable) uses, especially in helping to establish the Facts, which do, one must admit, bear some relation to Truth. The special problem with RO for us is that they make Scotus out to be the moustach-twirling villain of the history of Western thought, while essentially lying about what Scotus actually said and wrote and thought. Their books are marketed and presented as erudite and scholarly--certainly they are obscure and tortuous, and this gives them an impressive facade. But I urge anyone who doesn't like our criticisms to actually read some Scotus, enough to get a decent grasp of it, and then read some RO people on him, and then follow the "references" that they give to justify their presentation, and then make a judgment. I've done all these things. So has Faber. So have other qualified judges. After having done all these things, the only reasonable conclusions are that a) the RO people simply do not understand medieval philosophy, or b) they don't care what medieval philosophers actually thought if the facts interfere with RO's story about them. You may not care for medieval philosophy. You may not sympathize with anyone who thinks that a past generation may have been full of people wiser than most thinkers today. But perhaps you might at least admit that in order to make vast and wide-ranging claims about a thinker, for many years, in many books, with (if true) very serious consequences for understanding history and philosophy alike, one should first actually understand the thinker in question and make a reasonably adequate effort to present their thought accurately. RO, like many second- and third-rate "scholars", do not do this. Really glad I discovered this post. The analogy is so true! Over here in the UK, RO have too much exposure, and very little real challenge. A lot of younger academics get taken in by the hero-worship because they don't work within real confessional traditions; I've seen it from the student side and the teaching side. The real problem is as H. G. Wells said, 'in the country of the blind, the one-eyed man is king'. I'm a protestant theologian who has published on Milbank, and while I don't claim any expertise on either medieval theology in general, or Scotus in particular, Milbank's and ROs' whining about Scotus as if all the ills of the modern world (as they see them) somehow are due to him always struck me as unscholarly and risibly implausible. You might be interested in Stephen Webb's take on Scotus as a resource for modern theology, in his books 'The Dome of Eden' and also 'Jesus Christ, Eternal God'. Webb's work, along with that of Alexander Broadie on Scotus' relevance for Scottish philosophy and politics, were the two things that positively got me interested.